Sun-drenched fairways have been common place for golfers across the UK and Europe this summer, and the action is set to be just as hot at Spain’s La Manga Club in December when the resort stages the 18th edition of the popular La Manga Club Golf Open. Golfing legends Severiano Ballesteros, Arnold Palmer and Gary Player all feature prominently in the resort’s illustrious past, and amateurs from across the continent have the chance to write their own piece of La Manga Club history when the event takes place from December 3-8. Men and women will compete over 54 holes in a number of different categories for a range of top prizes, with this year’s competition, which will be played with a Stableford format on La Manga Club’s acclaimed North and South courses. Tournament packages feature five nights’ accommodation in the five-star Hotel Principe Felipe or four-star Las Lomas Village, with breaks including breakfast and a welcome pack; a welcome drink reception; a gala dinner and prize-giving ceremony. Prices also feature tournament entry for golfers as well as a practice round, practice balls and on-course refreshments during the event. In addition, event guests will also enjoy discounts of 15 per cent when eating at any of the resort’s Amapola, Asia, Luigi’s and La Bodega restaurants and recently- rebranded and renovated The Village cafe, plus complimentary access to the five-star Spa La Manga Club’s fitness centre, indoor pool, saunas and steam rooms. 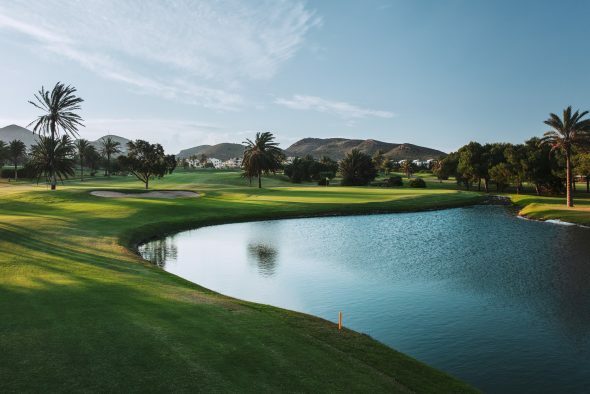 La Manga Club has been a firm favourite with golfers for more than four decades, with its facilities including three 18-hole courses, a nine-hole academy course and outstanding practice area. Chosen to host the World Golf Awards for the second year running in November, the resort’s extensive other facilities include a 28-court tennis centre, a European Cricket Performance Centre and a 2,000sqm Wellness Centre. In addition, it features the choice of a five-star hotel, four-star serviced apartments and townhouses and more than 15 bars and restaurants. A choice of five-night packages are available for the 18th La Manga Club Golf Open. All breaks include breakfast and a welcome pack; tournament entry, a welcome drinks reception; a gala dinner and prize-giving ceremony, and are available from €630 (approx £550) per person in the resort’s Hotel Principe Felipe, or €540 (approx £470) per person in the four-star Las Lomas Village apartments.